Located in South Lake Tahoe this holiday home features a patio. The unit is 700 metres from Tahoe Queen. A dishwasher an oven and a microwave can be found in the kitchen. A TV and DVD player as well as a CD player are provided. Other facilities at 3689 Spruce Ave Home Home include a fitness centre. Heavenly Ski Resort is 1.8 km from 3689 Spruce Ave Home Home while South Tahoe Ice Arena is 1.9 km away. 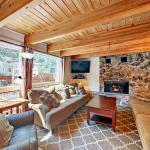 The nearest airport is Reno-Tahoe International Airport 64 km from the property.